THE GLOW IS NOT AS BRIGHT UNTIL FULLY DARK! 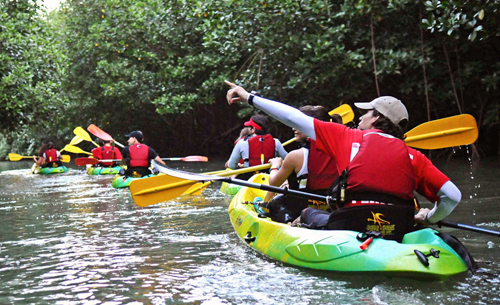 The initial 30 minute orientation covers basic kayak lessons and needed information for entering the bioluminescent bay without leaving any destruction in ones wake. Trips are made in double kayaks. No experience is needed. You will get wet so wear shorts or a bathing suit and bring a towel for afterwards. Back to the Biobay page.